I am redoing my front end and need some advise. I am replacing all the worn parts that I can find. Also Thinking about doing the Spring Perch Bushings too. Some of the parts like the Spindle Bolts come with brass bushings (Lang's Kit) and others like the Tie Rod Bolts or Spindle Arm (Lang's Kit) and Spring perches and ends come with the steel bushings. Should I stick with brass like original or is steel better in certain locations? It looks like I could order Brass Bushings for the Tie Rod Bolts(Spindle Arm) separately. Another question: I am thinking about ordering the Spring Loaded Ball Caps for the Drag Link. Is this a good route to go or are the original caps better. The reason I ask is the parts were worn (Bolts, Bushings and the Balls on everything) Now all being replaced and new but I am not replacing the Drag Link. Won't the Drag Link ends be worn as well creating some slop or is there little wear in this area. I would use the bits you have. The steel bushes are cheap and cheerful, and quick to change. The ones I have seen are 'split' and don't always fit perfectly - but it's a Model T! Whatever you use is exposed to all the road dirt and water. Nevertheless, the steel bits last well. See the recent thread here about re-bushing the spindles. These require care. I would recommend the spring-loaded caps if the balls are worn out of round. Otherwise, you adjust the fit with the bolts and locknuts at one position, but then when the joint swivels, it either goes loose or tightens - which could be dangerous - inducing fatigue. Set the springs 'tight' then back off by about 1/2 a turn. Use brass. Cheaper to change a $1.5 bushings than $50 shackles. Use what Henry used where Henry used it. Don't put soft brass in place of a steel bushing. "Should I stick with brass like original..."
You're operating from a false premise. The reason Lang's sent you those steel bushings is that they're what Ford used originally. I've never tried brass bushings in springs and perches, but I'd expect them to wear out pretty quickly given the virtually continuous movement while bearing a lot of weight. If the drag link sockets are worn enough to be loose you can put in shims to take up the space. You can get them ready-made from the parts dealers, or you can make them from washers or coins. Until I replaced them with NOS steel bushings, the original bushings in the front spring of my unrestored '17 roadster were bronze. The main leaf is not drilled for oilers - the car has figure-eight shackles with steel spring loaded oilers. The original bushings are still in the rear spring. Off the top of my head, I can't remember if they are bronze or steel. Logic. You can get bronze bushings any time. You can't get NOS spring shackles. I have bronze bushings in every T I own, and they don't wear. Have you ever heard of oil? My '13 touring has over 50,000 miles on it, and still has the bronze bushings I put in it in 1962. Go figure. Wait . . . . I am very confused here. The Spindle Bolt Set (King Pins) from Lang's come with Brass Bushings. This seems right because that is what I am removing right now. The Tie Rod Bolt Set from Lang's comes with Steel Bushings but I thought the Tie Rod Bushings were Brass on my late 1921 / Early 22 Touring. I think the ones that are in there now are brass. Should I be going steel here or buy the separate Brass bushings. Next are steel bushings original in the spring perches and ends? "correct" for your car or any car, would be brass bushings in spindles. I don't believe anyone supplies them in any other form, so you can't go wrong. Very early cars had brass or bronze (probably brass) in the perches and spring eyes. just realized you are doing the steering shaft too...that's brass and that's all you can buy from the suppliers. Scott Conger "correct" for your car or any car, would be brass bushings in spindles. I don't believe anyone supplies them in any other form, so you can't go wrong. Scott that is were the confusion is for me. The Spindle Bolt Set (King Pins) from Lang's come with Brass Bushings. I replaced all the bushings in my 16 with parts from Langs, steel for the spring shackles, steel for the steering parts. Brass for the spindles. Made my own steering bracket bushing to compensate for an undersize steering shaft. Isabel didn't care what I used, she was just happy to get new parts. No matter what you use proper maintenance is the key to happy car. Here are the confusing bolts I am talking about. They include steel bushings but I thought they should be Brass. Maybe they are steel its hard to tell what the heck they are in the Spindle Arm. Mine are thin and highly worn. This is what was also confusing. Lang's also sells these brass bushings for the Spindle Arms. Why would you want these if steel is what was used. Larry "Original" Smith has that nickname for a reason. He knows what's original, and he uses it mostly. In the case of the spring and perch bushings he's willing to stray from the original steel and use bronze to save the shackles. That makes sense. While the tie rod bolts are easier to come by, bronze bushings there would be OK for the same reason, even though steel is original. The same goes for spindle arm bushings. Steel originally, but bronze OK.
By the way, your serial number dates the engine to Thursday, November 17, 1921. That puts it early in the 1922 model year, which began in August. The encyclopedia says there were only a few minor differences between 1921 and 1922 cars. Ok sounds good. 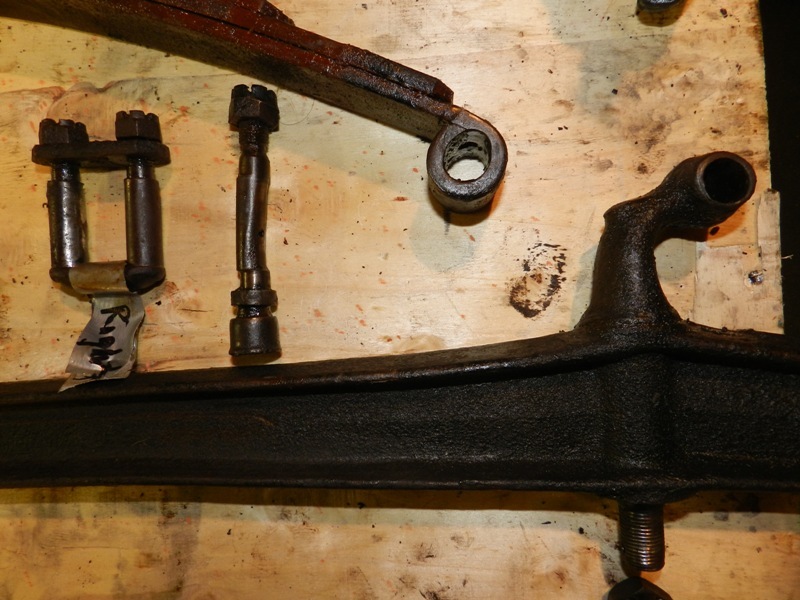 I will go with Bronze Bushings for the Spindle Bolts and Steel for the Spindle Arms as was original. I have the Hassler Bee-hive front Springs. I guess I should have mentioned that before. What should be replaced here? It looks like my right Perch might be bent (SEE: space between the bottom and Front Axle). In the picture you can see that the Hassler rear stop next to the oilier is not touching the top of the Axle either. Lastly it also looks like some space below the original spring ends (Possible Oblong-ed Hole)?? The most important bushings are in the spindle bolts. The bronze can easily be reamed to make a god fit. The end flanges on them are also cut to fit into the ends of the axle so that everything is snug but does not bind. Those should definately be bronze. 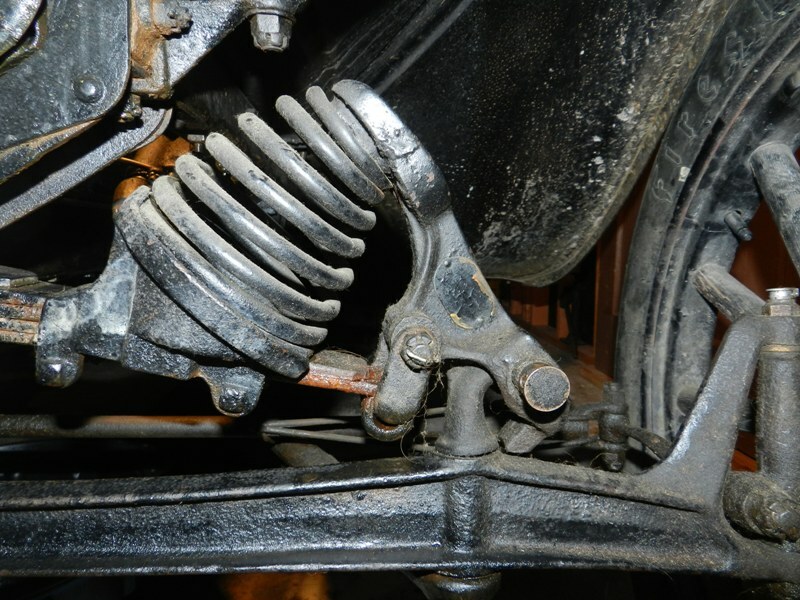 The springs, tie rod ends were originally steel. Those can be made to fit very nicely, but unfortunately some have been rolled quite unevenly and do not press easily into the spindle arms. You need to get a good set of steel bushings for both the spindle arms and the spring shackles. They are not as critical for dit as the spindle bolts (king pins) For the ball joints I would recommend that you use the roundest ones you can find. The spring ends although they are not original type equipment, they are period correct replacements and as posted above will take some out of round ball. I prefer to use thick leather soaked with oil for shims in loose ball joints. It has more give than metal and will not cause further wear on the balls. Check all the above locations often to be sure everything is snug and enjoy driving your T.
I have used just about all brass bushing's in a running gear rebuild. Use a expandable reamer to fit the single bushing's just so the bolt will turn with out binding, and with out movement. All the early cars had Brass, and it has always lasted better then steel for me, and they don't rust or gall. There are not any places that I can think of that has steel to steel for a bearing. I really doubt that Henry used brass for any bushings on the T. Now bronze I will agree with. BIG difference. Huge! The gap you speak of is due to huge wear in your spring hanger. The bushing in the spring is probably worn completely through as well. A new bushing will help there but I think you're in the market for a new hanger. Don't know till you disassemble however. There are also many variations of Bronze. Standard Bronze, Naval Bronze, Silicon Bronze, Manganese Bronze, Oilite Bronze - which is most often used for bushings on turning shafts IE motor shafts, etc. Brass is a combination of copper and zinc. Bronze is a combination of copper & tin with small amounts of other elements to obtain desired hardness and machining ability. Brass is soft and very malleable,easily machined and distorts and bends easily under pressure. As a general statement, it is not suitable for bearings with stress or deformation possibilities. It is often used as the sacrificial piece in assemblies where wear is virtually inevitable and replacement of the brass part will be cheap and easily done. Bronze on the other hand, is harder, not very malleable and more difficult to machine. Because of the Tin in the basic formula and the addition of Silicon in what is known as Silicon Bronze the cost is double to triple what spec 360 Brass costs. For example: I use a lot of 1/4 inch shafts for carburetors. A 6 foot stick of 360 Brass from MSC lists at $15.60 Naval Bronze - which is standard Bronze with the addition of small amounts of Nickle - lists at $24.68; Silicon Bronze is $40.30. Brass is not a good bearing surface. Old Model T spindle bushings are Bronze. So were the bushings used in other places. I'm with Les, I don't think there are any Brass bushings. I might be wrong but I can't think of any. These Bushings sold at Lang's must be typos then in the descriptions. I think people must be using the term Brass and Bronze interchangeably. I have been by mistake. I thought those holes in the picture looked a little long. I think I will put the front end parts back together and then tackle the Springs and there bushings. I just finished replacing my front spindle bushings today for the first time (I replaced worn out bronze bushings with new bronze bushings). I checked the tie rods and they were tight, so I did not replace them (the tie rod bushings on my car are steel). 1. I had to use a hacksaw blade to cut slots in the old bushings before they relaxed enough for the split bushing driver to drive them out. 2. I have a cheap hydraulic press from Harbor Freight, so pressing in the new bushings was a snap. 3. The line reaming tool works well, but it's slow going and a lot of work using it by hand. I used lots of oil and cleaned the chips out a lot to keep the reamer from getting loaded up. 4. The bushing end face reaming tool works very well. I had to spot face my bushings to get the spindles to fit in the front axle yokes (I did not have to put a shim under any of the bushings to get more spindle height). I took a light cut on the top bushing just to get it flat and square, then did the rest of my cuts on the lower bushing. 5. The inside surface of the upper axle yoke (where the upper bushing rides) had an unworn "ridge" around the wear surface that I carefully removed with a fine file. 6. Both of the lower axle yokes had helicoils in them where the spindle bolt threads in. I had to replace both helicoils because whoever installed them did not do it right (the uppermost part of the helicoil must be at least 1 thread below the surface, so that the end of the helicoil can "dig in" to prevent the insert from backing out when you need to remove the bolt at some future date). Hope this helps any others contemplating doing this for the first time. 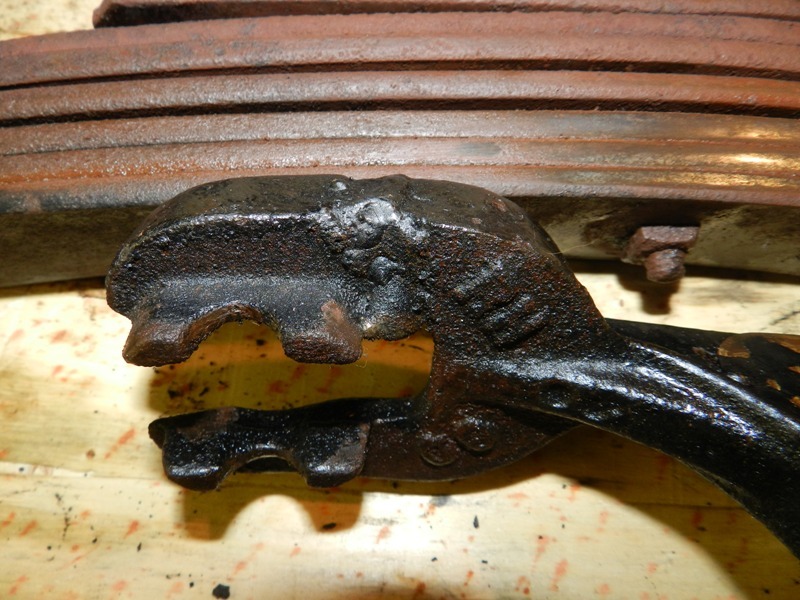 Here is an old story I heard years ago that makes sense about why Henry switch to steel bushings in the springs and tie rod ends. It was easier for the farmer to replace the shackle or tie rod bolt than the bushing. I'm assuming the steel bushing were not soft? It was most likely a cost saving measure, switching from bronze to steel. "I'm assuming the steel bushing were not soft?" The originals that I've removed were quite hard, the modern reproductions from the vendors are a lot softer. I agree with Stan and others regarding bronze vs. brass. However, I've done an awful lot of front ends and have never used a modern part which appeared or reamed like bronze. I may be wrong, but it seems like the new kingpin kits are using brass bushings. The parts that came out were bronze, but the ones installed didn't seem to be. I don't know when Ford discontinued using bronze bushings for the springs and the tie rod ends, but I would assume it was after the brass era. Another thing to consider is the year of the car, but since you can't see these bushings I guess the owner of the car can do what he wants, but I'll stand by what I said earlier. Thankyou for the kind words Steve J. Here is an update on my Front End rebuild and what I discovered. I took the front end out of the car and brought it to the bench. I disassembled it on the bench and found some interesting things. It was worn beyond belief. I ordered most of the parts I need but these major parts in the list below, may or may not be salvageable. Front Spring (The Ends are oval and the second leaf from the bottom is worn from the Hassler Mounts. fter dissembling the parts on the bench I noticed that the Hassler Top Spring Arm was welded where one of the fingers attaches to the arm. I am starting to think that the car was in a wreck or hit something hard enough to break the Hassler Arm Finger, Bend the Perch and require a new Spindle bolt to get it back on the road again. The battle continues here in Missoula. I'll let you know how the perches come out. If they come out! Wow, Adam - someone must have lost the oil can ! If you can't find replacement parts local (Stan Howe in Helena), I can fix you up if you want to make the trek to Western Washington. That confirms what I suspected from your earlier picture, shackles wore into the spring. Fortunately all the parts you need are readily available for black era cars. The shackles don't look bad, compared to everything else. I'm not saying they're good enough to use, just that they're less bad than some of the other parts. If the perches are tight in the axle, that suggests to me that the holes are OK. What may not be OK in a car that's been so neglected is the threaded spindle pin holes at the ends of the axle. Sometimes those are worn out and have to be fixed. You can fix the threaded pin holes in the ends of the axle with a 1/2-20 helicoil kit. be sure to read and follow the directions. Make sure the axle has no other issues before you spend the money for the kit. Hey thanks for the offer Steve Tomaso. I will let you know what I find around the area. Setve J. The threads in the end of the Axle look ok to me and held the bolt tight but I will have to give them a good eval before I decide the Axle is usable. The wear found here is exceptional and I am glad to be fixing it and correcting it. 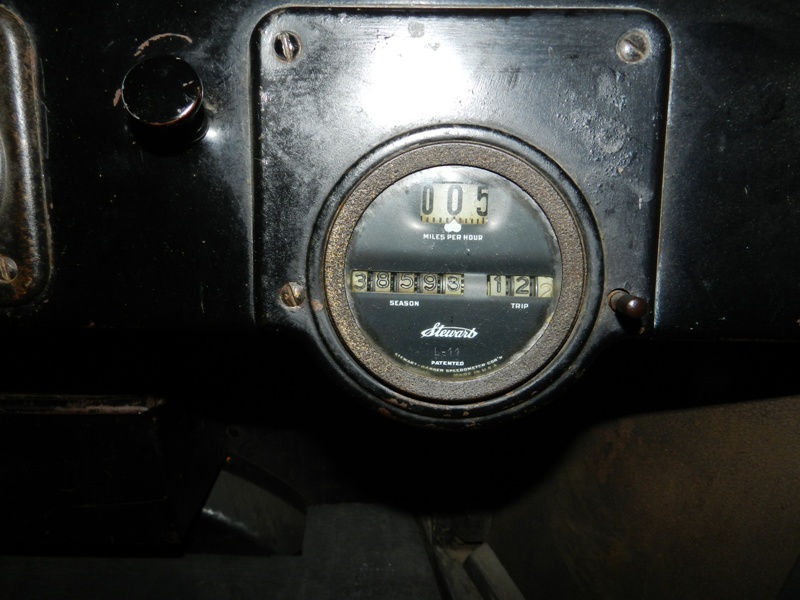 The Speedometer reads 38,598 miles and who knows when it was connected and then disconnected later in this cars life. So I am sure somewhere along the way the oil can was left out of the equation. I know I won't forget it after this rebuild. I probably have 10 miles behind the wheel of the car. I have learned allot so far and there is more to come. I'm wondering what your feeling is on the Hasslers? A lot of people have them, but are they worth the effort? Well in my opinion, I thought the car had allot of body roll or tip, especially when you stood on the running board to get in. It made the car very springy you could say. I think bumps might be a little softer but I don't really know. 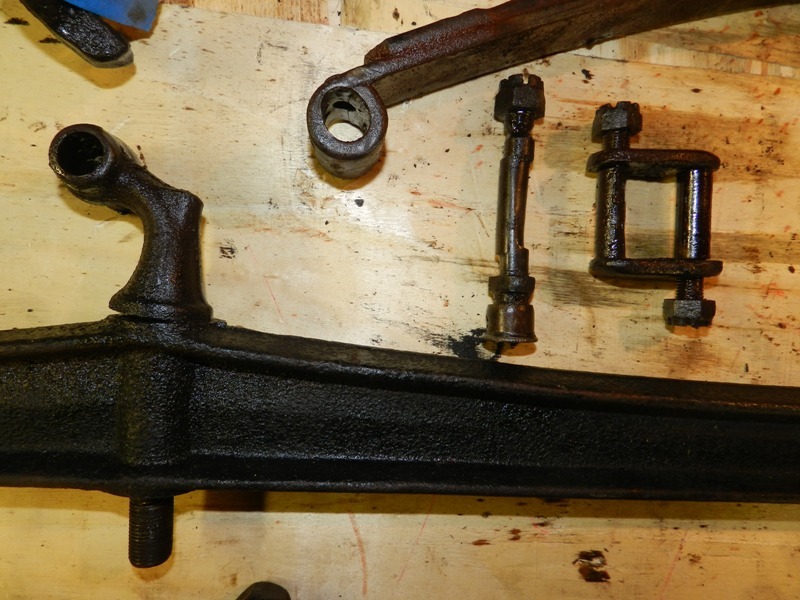 Take a look at the pictures of my front end parts and you can tell I have no idea what a real Model T should feel like. I hope some more knowledgeable people chime in about the Hassler Shock benefits or drawbacks. I would really like to know what the difference is as well. I expect a Google search of the forum would find wildly divergent opinions on Hasslers. I've seen comments from some who think they're great, and from some who think the opposite. Maybe I'd love them if I had some, but so far I haven't missed them. Since you are going to rebuild the front end any how, why not leave them off. In my opinion, they don't offer any improvement, plus we have better roads now days. Save your self some money. Larry, I think that leaving them off is going to be the new plan. I might rebuild the Hasslers as a side project during some down time, just to have them. They came with the car and look to have been apart of this cars accessory package early on in its life. Original seems to be the better option as I am hearing more and more. Way to go Stan Howe!!!!! Very correct. Bronze is the way to go. Aviation Supply. Henry may have, as well as some of the aftermarket people, during the old days made them from steel. Just to save money. BUT you were THEN dealing with new clearances and ROUND shafts. Most wear on a T thru the years has left all those shafts and holes worn oval or egg-shaped as all of you well know.When rebuilding most of the cars I build I ream the holes and turn out bronze bushings. If you have a driver by all means drill out the oil holes too and run the oiler caps. Oil frequently. I even have to make my own bronze bushings for the open valve blocks. I could not find any of those when I redid my early engines. If you have wear and are not able to repair it then use the steel. Watch your old round shafts for wear and use plenty of oil. Merry Christmas to you all (even if you don't celebrate it)! 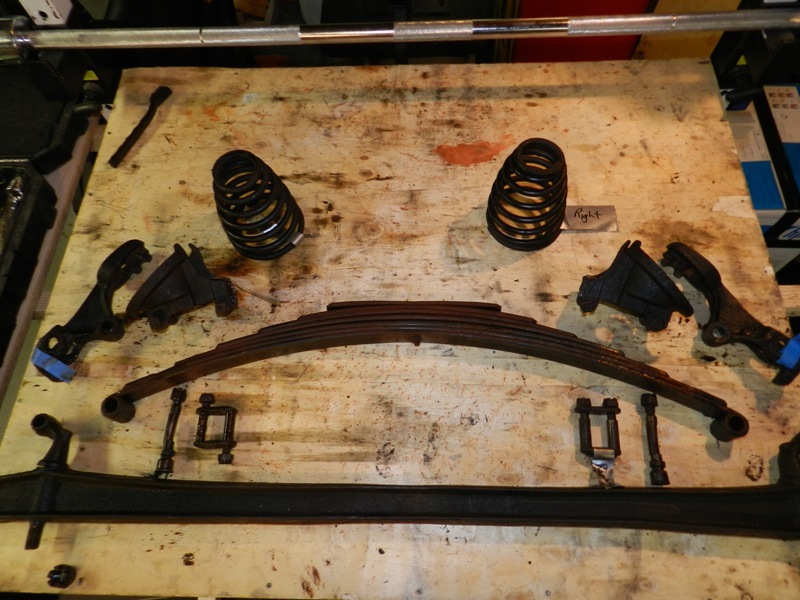 Joseph, I am replacing the front end parts with all new stuff, Shackles, Perches, Used Salvageable Spring Leaf . . . Can I use steel in this case as well since everything should be round being new. Larry, I have them and I also have lots of body roll. I wouldn't go out of my way to find them. Sent from 35,000 feet, 2 hours East of Denver, headed for Tampa.